The first time Jack visited my hometown of Portstewart and met my family, my parents enquired if he came from “horsey people?” Not because an equestrian background is a pre-requisite to dating their daughter, I hasten to add —we’re a far cry from William and Kate. No, they asked because to many, horses are to Kildare what flat caps are to farming. Indeed, the county is at the very centre of Ireland’s equine industry. Home to more stud farms than any other county in Ireland, Kildare also boasts world-renowned race-courses including those at Punchestown and the Curragh. 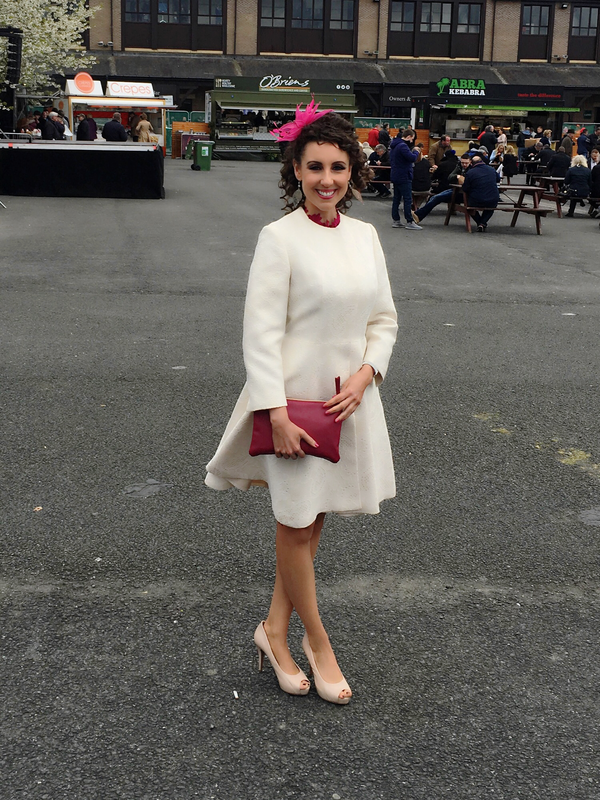 Not surprisingly then, a day at the races is an annual highlight on the social calendars of many Kildare residents. Jack’s parents go every year when the excursion is as much a celebration of the fact that lambing is drawing to a close as anything else! Jack, too, goes when he can — the event providing a perfect opportunity to catch-up with friends he mighn’t have seen since the previous year’s festivities. So, when he asked if I could swing a day off work to attend day three of the world-famous Punchestown Festival, I was, of course (and you’ll forgive me for this. . . .) chomping at the bit. Now, what I know about horse racing rivals that which I knew about farming when I first met Jack. All the digits and decimals in the little festival brochures mean nothing to me: I place my bets based on the horse’s name, or the colours of the jockey’s silks. Seemingly, however, this approach works as well as any. The farming symbolism too blatant to ignore, I backed “Great Field” to win the 18:40 Ryanair Novice Chase —and win he did! Jack got lucky, too, betting on Minella Awards for a win in the 5th race of the day. Truth be told, there’s a part of me that doesn’t want to like horse racing. Whether on television or in person, the sight of a horse falling at the jump turns my stomach. Nor do I like the repeated cracking of the whip against the flank of an animal that’s already racing flat-out to the finish. And then there’s the grim reality that for every great equine success story, there are just as many, if not more, equine fatalities. At the same time, I can’t deny the draw of the races. The rhythmic thud of the horses hooves on the ground, the intensifying energy of the crowd as the horses enter the final stretch, and the roar of those spectators who see their horse making a break for the finish. Jockeys bent low, their knees bent high, the slightest of pilots steering these incredible power houses to victory, or not. It’s ironic, in a way, the fact that just as it is responsible for cutting short the lives of many horses, it is also racing that gives us the opportunity to see these finest of specimens up close and in their prime. Stunning creatures with their gleaming coats and rippling muscles; the long, arched necks, bright, gentle eyes, and the elegant legs that look too delicate to carry the weight of the animal above them. But there are other ways to appreciate these animals, too. After we’d covered the cost of a decidedly more decadent-than-usual takeaway the day following the races, Jack and I decided to put what remained of our winnings toward a visit to another Kildare gem — the National Stud and Japanese Gardens. There, we saw some of these marvellous animals in their paddocks, unburdened by saddles, bridles or humans. When one would take off on a trot or gentle canter around the field, free from all the trappings of the races, we witnessed an animal in flight. Born and raised on Ireland’s North West coast, there are those times when I miss living by the sea — on a rare, scorcher of a day, for example, when the salty breeze and cool water provides welcome relief, or, on a stormy night when you can stand in my parents’ back garden and hear the waves rushing in, pounding the shore. By the same measure, however, I realise how fortunate I am to have been invited into Jack’s world and his home county of Kildare. From the little gifts that farming brings, like when I bottle feed a hungry lamb or cook up a batch of spaghetti Bolognese made from beef reared on his family’s farm, to the luxury of traveling just thirty minutes up the road to watch some of the world’s best racehorses and feel the vibrations of their hoofbeats on the ground —some of Ireland’s finest land— beneath our feet. In these moments, that coast-to-country trade-off is one I really can’t find fault with. Jack does actually have something of a horsey background. As children, he and his siblings shared a much-loved pony called Silver and a rather more ornery Shetland Pony that went by the name of “Beauty,” and behaved like anything but. In the latter’s case, any would-be equestrian inevitably spent less time in the saddle and more time in the dirt, such was Beauty’s attitude to being ridden. With horsey history like that, who could blame Jack for preferring the company of cattle?